While the production of photos for the mass market was confined to the High St developing shop, only the pro or the enthusiast would get involved in post-processing–and this would invariably be very hands-on and visceral. You were dipping or dripping or cutting or brushing. Real craft. The suspicion that tinkering with your images on a screen wasn’t quite legit crept in, as I remember it, when the desktop scanners appeared at the end of the 80s. Then this thing called Photoshop came along, and a million other editing tools flourished. Now we have apps like Instagram that knit together the whole process of image capture and application of effects in a single package. Because, as I’m essentially a digitally-native photographer, I see the software as just as valid a tool as the shutter. What counts for more: the process of creation, or the thing you create? Fairly low-light, but because it’s a still composition I choose a slow shutter rather than a very high (and therefore grainy) ISO number. Post-production is in Lightroom–first cropping to a square composition, then using a little colour correction and a lot of sharpening, to bring out details of the clashing geometries. This is all well and good, and of course there’s some truth in there. A great image out of camera always gives you a headstart. And if it’s what you do for a living, getting it right in the camera saves you time. And time is money etc. etc. Oh, and the consequences of manipulating photojournalism are pretty obvious–don’t expect to make a career out of it once you’ve been rumbled. But really, tools are just tools, whether made of glass or bytes. You should be judged by result, not process. Anyway: back to that featured image above, which triggered these thoughts on post-production. It’s shot in gloomy light, in a chapel. To be honest, the chapel struck me as a bit hum-ho Victorian Gothic. Was there anything there that would make a really unusual frame? What could I grab in the minute I had that might give a different view of a fairly traditional subject? And as I walked, I caught the last of the evening light reflected in the huge glass screen separating chapel from entrance. 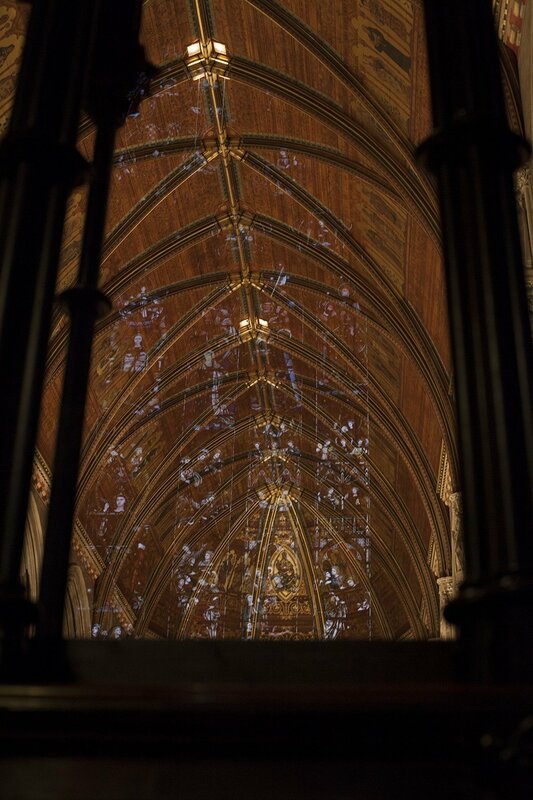 Throwing a stained glass pattern across the visual field of the vaulted ceiling. That’ll work, I thought. The settings chosen: a moderately high ISO but nothing that would cause the 5DII sensor too many problems. A shallowish depth of field at f/4.0 (but with the focused subject quite far from the lens that wouldn’t be too noticeable, and would also let more light in) and a slow shutter at 1/15. Though I could see this would underexpose the image, any slower would introduce shake and blur. If I’d used a tripod I might well have halved that shutter speed knowing I’d have a steady shot regardless. But better to have a darker image I could lighten later, than a fuzzy one: you can raise exposure in post-processing with ease, but it’s much harder (and often impossible) to remove motion blur after the event. I know what I’m after–that square in the centre of the frame where the interesting pattern-clashing is going on. To get a bit music-pseudy about it, it felt like a visual expression of a cross-rhythm (where two different rhythms can be heard at the same time in the same piece of music). 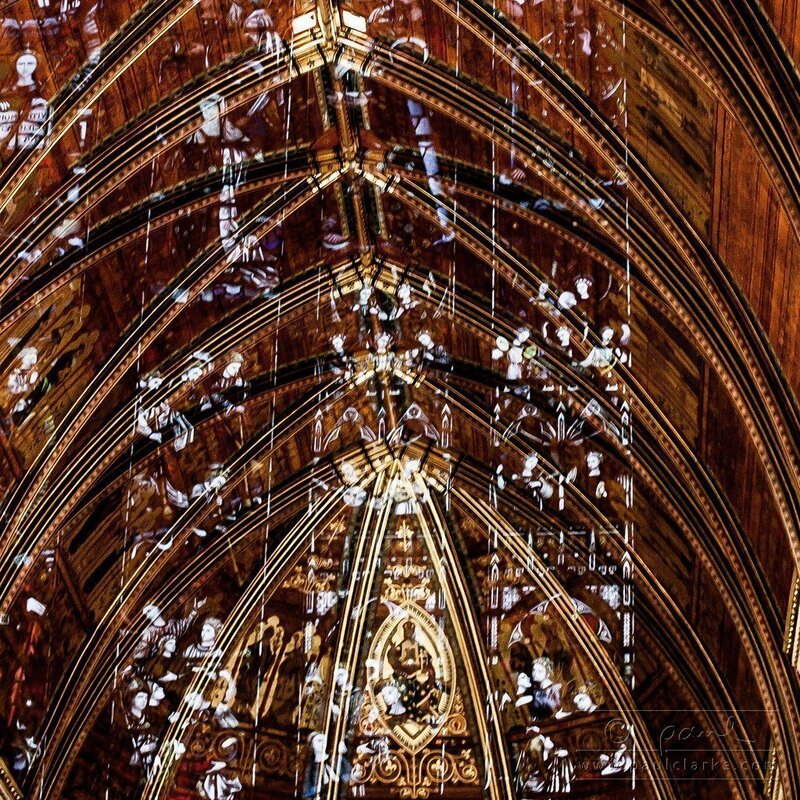 I want the geometric details and the emphasis of curve-against-straight, and I want to be able to pick up the outlines of the saints and all that. And I know I can bring these through in post-production. So I do. Am I to be judged harshly for that? Paul, I’ve been around “old pros” for quite a long time, and can confirm “SOOC” was always a myth. At the very least, commercial work pre digital was required to be crop-able. One reason for the popularity of square format on film. The darkroom arts were considerable, and only the forerunners of today’s ability to manipulate a digital image. What I think has always been the premium entry level for a good shot, regardless of the degree of manipulation, is sharp focus. Neither the best darkroom technician nor the best software can make sharp silk purses from fuzzy sow’s ears. To a landscape photographer “getting it right in camera” might mean creating an image that will work as well in portrait format as in landscape, after cropping. To a press photographer, getting it “right” might mean photographing the truth in a way open to alternative interpretation, whether manipulated, cropped, or whatever. But clarity will always be the start point.